alphabetical: Hawk << Headhunter >> Headhunter B.A.T. Notes: DiC's Headhunters wore the 1992 outfit, a lavender shirt under the jacket, and a brown belt. Accessories: black sawed-off double-barreled shotgun (new), clear purple handheld light-up spring-loaded missile launcher (new), black spring missile with four fins on football-shaped tip (new), black backpack with engraved canister and holster on side for shotgun (new), black figure stand (common). The Headman recruits his personal bodyguards from the greediest, most ruthless drug dealers and criminals in the world! He offers them a big money stake in his global operation and a chance to live out their meanest fantasies in return for absolute loyalty and obedience. HEADHUNTERS are driven workaholics with evil ambitions. They are willing to undergo constant and rigorous training in advanced weapon systems and fighting styles to further their careers in the Headman's organization! Motto: "If anyone so much as looks at Headman the wrong way, we'll just have to adjust that person's vision by knocking his lights out . . . literally!" Toy Notes: Item #6750. In the 1992 insert catalog, concept art appears instead of the actual figure. In the commercial, Headhunter's missile launcher was light blue. 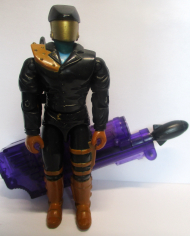 Accessories: black shotgun (92 Headhunter's), purple spring missile launcher (92 Headhunter's, with no light up feature), bllack spring missile (92 Headhunter's), black backpack (92 Headhunter's), black figure stand (common). 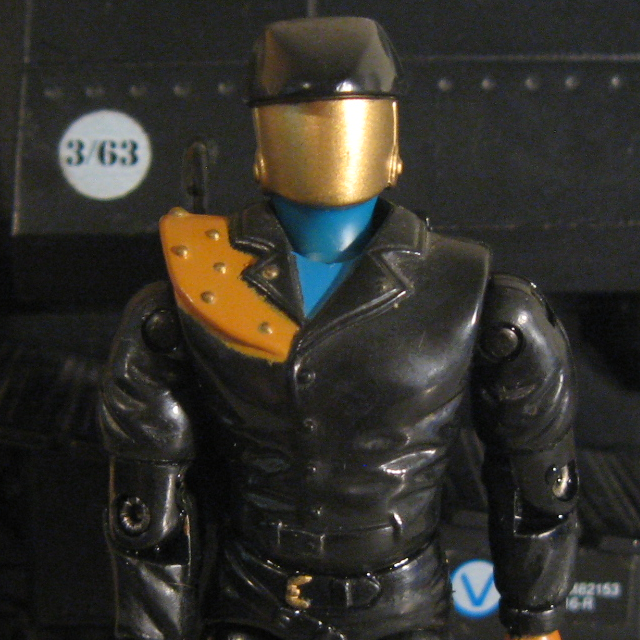 Cobra recruited these highly trained guards from the greediest, most ruthless criminal organizations in the world! They offered them a big money stake in Cobra's global operation and a chance to live out their meanest fantasies in return for absolute loyalty and obedience. HEADHUNTERS are driven workaholics with evil ambitions. They are willing to undergo constant and rigorous training in advanced weapon systems and fighting styles to further their careers in the Cobra's highly illegal—and totally ruthless—business ventures. Motto: "If anyone so much as looks at us the wrong way, we'll just have to adjust that person's vision by knocking his lights out . . . literally!" Toy Notes: Originally intended as part of 1993's D.E.F. line, but moved into Battle Corps when it was canceled. The Australian release retained the D.E.F. packaging. Item #6186. Accessories: silver revolver with brown grip (02 Dr. Mindbender's), silver shotgun with brown grip and fore-end (07 Shipwreck's), silver rifle with brown grip and bayonet handle (02 Neo-Viper's), black backpack (92 Headhunter's), clear figure stand (common). HEADHUNTER GUARDS are recruited from the greediest, most ruthless criminal organizations in the world. GRISTLE offers them a big money stake in COBRA's global operations and a chance to live out their meanest fantasies in return for absolute loyalty and obedience. They are willing to undergo constant and rigorous training in advanced weapon systems and fighting styles to further their careers in COBRA's highly illegal and utterly ruthless business ventures. Frightening in both their skill and number, they seize whole cities and infest them like rats, using civilian warehouses to stockpile contraband for worldwide distribution. They even provide fronts for international money laundering along with the manufacturing of illicit materials. Knowing the value of the often-hazardous goods they deal in, they are adept at setting up tripwires and booby trap devices to protect their inventory and take care of anyone foolish enough to enter their domain. "We'd rather see the whole building blown sky high than let the authorities get their hands on what we're guarding!" Toy Notes: Two copies were boxed in a Convention-exclusive set with Gristle, six copies of Headhunter Stormtrooper, and six copies of Headhunter B.A.T..